Brunswick Forest is a lovely active lifestyle community located in Leland, North Carolina. This picturesque coastal community is a 4,500-acre retreat surrounded by lush woods and is situated just ten minutes from historic Wilmington and 30 minutes from Atlantic beaches. Upon completion, Brunswick Forest will have approximately 8,000 homes. Amenities throughout the community fit all levels of activity and there are many clubs that provide plenty of opportunities to stay active both indoors and outdoors. Staying healthy and fit is made easy because of the 18,000 square-foot Fitness & Wellness Center. This modern fitness center has state-of-the-art cardio and strength training equipment. This beautiful facility also features an indoor pool with lap lanes, aerobics studio, and locker rooms with showers and a steam room. After a hard workout, residents can relax in the lounge or have a massage in the massage room. The Fitness & Wellness Center also provides an outdoor pool with a wade-in entry, expansive sundeck, and snacks and drinks at the Splash Cafe. Outside, residents can take advantage of North Carolina's mild weather with five hard-surface tennis courts and an additional multi-purpose sports court. The Fitness & Wellness Center is accessible by the community s walking and biking trails. This community provides more than 40 miles of paved and unpaved walking and biking trails that connects the outdoor amenities like the community garden, the golf course, scenic lakes and ponds. A popular outdoor feature is the Community Commons that serves as a meeting place for clubs and events. The community commons provides a fireplace and a kitchen for demonstrations within the glass-enclosed house. Brunswick Forest boasts one of the most distinguished golf courses in the coastal area of North Carolina. Cape Fear National Golf Course provides 18 holes of championship golf designed to impress and challenge golfers of every level. It also offers a 7,000 square-foot clubhouse with indoor and outdoor dining, a pro shop, and locker rooms for its members. Another exciting amenity is The River Club. This river area offers residents the opportunity to enjoy a canoe, kayak, or small boat on the Intracoastal Waterway and Cape Fear River. Residents can also fish or plan waterside picnics at The River Club. Brunswick Forest first opened in 2007 and upon completion the community will have about 8,000 homes built by many reputable builders. This community provides many options for style, size, and price range for homebuyers. Single-family homes and townhomes can be found throughout twelve different neighborhoods. Each neighborhood has its own character and design style. Floor plans are not limited to one neighborhood, so finding your dream home in the perfect area is made easy. The upscale townhomes are found throughout the Ashwood, Park Landing, and Evangeline neighborhoods. All of the townhomes feature first-floor master suites, at least two bathrooms, and attached garages. These low-maintenance townhomes range in size from 1,133 to 2,254 square feet. There are a large variety of single-family home styles that range in size from about 1,011 to 3,511 square feet. Homebuyers are drawn to the single-family homes that provide main-level living with first-floor master suites. Whether you are looking for a low-maintenance cottage-style home without a garage or a Florida-styled home, each of the single-family homes found within the twelve neighborhoods provide open space and picturesque views. Residents enjoy their lifestyles with like-minded neighbors in Brunswick Forest. Resident clubs offer endless opportunities to enjoy your favorite activities or try something new. Residents gather regularly at the Community Commons for cooking demonstrations, book club meetings, or birthday party events. Since staying fit is an important factor of an active lifestyle, there are many athletic and fitness club opportunities. Residents can attend a water fitness class in the outdoor pool, join a tennis club, or participate in an exciting Zumba class in the aerobics studio. Brunswick Forest is about five miles south of historic Wilmington, North Carolina on US Highway 17. The prime location in Leland is ideally close to many attractions in the coastal South. Nearby towns like Myrtle Beach in South Carolina provide famous golf courses, outlet shopping, and sandy beaches. Boaters have a choice of more than 25 marinas located along the Intracoastal Waterway and Cape Fear River. The Villages at Brunswick Forest is a 500,000 square-foot shopping center conveniently located right next to the community. Residents can access The Villages without ever leaving the neighborhood through the walking and biking paths. The Villages is home to New Hanover Medical Center, a 40,000 square-foot medical building with many physician offices. Also, The Villages at Brunswick Forest has a CVS Pharmacy, BB&T Bank, Brunswick Forest Vet Hospital, State Farm, Pizzetta's Pizzeria, Lowe's Foods grocery store, and many more businesses. Brunswick Forest's Fitness &amp; Wellness Center is linked to the community through a network of paths and trails. Enjoy a championship golf course at Brunswick Forest that is open to the public. The Community Commons is a popular outdoor feature of Brunswick Forest with water views. The glass-enclosed house provides a fireplace and kitchen for demonstrations. The River Club is a small boat launch facility. There is a small pier and a boat launch for small boats like kayaks, canoes, and rowboats. Residents can fish, paddle, and picnic near Cape Fear River and Intracoastal Waterway. There are plenty of activities available in Brunswick Forest. Here is a sample of some of the clubs, activities and classes offered here. The townhomes inside of the Evangeline neighborhood of Brunswick Forest provide 1,133 to 1,531 square feet of living space. Each attached townhome features at least two bedrooms, two bathrooms, and an oversized one-car garage. The townhome design in Park Landing is the ideal plan for low-maintenance living. It features a front porch, three bedrooms, and a two-car garage. The master suite features a walk-in closet and master bath. The cottages at Meadow Park feature Brunswick Forest's coastal cottages that are low-maintenance, yet high-quality homes. These traditional Carolina homes range in size from 1,011 to 2,199 square feet and provide two bedrooms and two bathrooms. Ashwood at Brunswick Forest is a neighborhood of low-maintenance, single-level townhomes that feature lavish master suites and spacious interiors. These townhomes provide 1,761 to 2,254 square feet of living space. Each townhome has at least three bedrooms, two bathrooms, and a two-car garage. The beautiful single-family homes at Park Landing in Brunswick Forest range from 1,641 to 3,196 square feet of living space. Each home has at least three bedrooms, two bathrooms, and a two-car garage. The bungalow-style homes inside of the Shelmore neighborhood at Brunswick Forest are single-family homes that have open floor plans ranging in size from 1,662 to 3,325 square feet. These homes feature gourmet kitchens, large master-suites, and high-end finishes. This neighborhood is home to Hammock Lake and many walking trails. Brunswick Forest's Evangeline neighborhood features luxury single-family homes. These single-family homes range from 1,662 to 3,231 square feet. Residents enjoy this quite corner of Brunswick Forest and its close location to the Fitness & Wellness Center. The Villamar neighborhood inside of Brunswick Forest consists of 72 Florida-style homes ranging in size from 1,841 to 2,483 square feet of living space. These single-level homes feature first-floor master suites with bright, open floor plans and high ceilings. Parkview's traditional Southern brick homes range in size from 1,662 to 2,934 square feet. Each home has at least three bedrooms, two bathoorms, and an attached two-car garage. There is a wide variety of single-family homes in the Walden neighborhood of Brunswick Forest. Homes range in size from 2,170 to 3,402 square feet. Many homes feature first-floor master suites and all homes have an attached garage. The Cape Fear National neighborhood of Brunswick Forest features golf course views with spacious home designs. Homes range from 2,554 to 3,511 square feet and have at least three bedrooms and an attached two-car garage. The Belshaw neighborhood at Brusnwick Forest consists of 68 single-family homes. This neighborhood provides resale homes that have at least three bedrooms, two-and-a-half bathrooms, and a two-car garage. Please Note: Floor plans are not available at this time. The Gardenwood neighborhood of Brunswick Forest consists of 72 homes. These beautiful brick townhomes are offered on a resale basis and provide low-maintenance designs. Please Note: Floor plans are not available at this time. People are very friendly and the neighborhood was in a convenient location. This neighborhood is in a state of growth and expansion and the present amenities ( which look run down ) are certainly too few for all the new developments continually being built. We feel we should have asked different questions and should have looked further. Take your time. Common areas should be upgraded and expanded! After visiting with our realtor a few weeks ago I find many of the reviews posted to be fair, honest and open. Yes, it is quite beautiful, yes, it seems a bit over built and yes, the available amenities space has not kept up with growth. One of the main concerns is the manner in which Brunswick Forest is marketed. It leads you to believe this is an active adult type development. If anyone is still in the process of finding the right retirement community I strongly suggest: age restricted to 55+ ONLY in a gated community. I want to thank Christopher Columbus Creekmore my realtor through Carolina Plantations for making the purchasing of a home a wonderful experience. Chris is very professional and enjoyable. He went out of his way to spending 4 days with me. Spending a day in Wilmington and showing me the sites, visiting communities and selecting a homesite and home to build. I would totally recommend him as the realtor for his knowledge, warm presence and in all a fantastic experience. There is no stone unturned as he will be extremely thorough. I also have the pleasure to work with Brian Galeucia since I selected to build in Brunswick Forest. This has also been a wonderful experience. It is such a please to work with him also. This will also be an on going experience as I work through the building process. Because of building I will be working with Mark Maxwell. He has been very thorough and a pleasure to start this process. I'm excited to work through this process with these gentlemen for the next year. I know that 55places has rated Brunswick Forest as one of the 10 fastest growing communities. This is probably true, but there are some questions you need to ask your sales rep. This is a friendly community with an ideal location. But, you will want to know what the developer is doing to keep pace with this growth. We already are unable to provide meeting space for the clubs and activities that the developer boasts as a positive. Pickleball courts and Tennis courts are becoming overwhelmed as our population grows. And the two outdoor pools are hardly sufficient for our needs. Understand, I love this community and the people who live here. But, if amenities are important to you, make sure you get the answers to your questions from the sales people. Population quickly outgrowing amenities. Loud construction traffic everywhere. Do not buy along major road ways, it's noisy. Very friendly communities and people. I am in hope that the developer will add additional amenities as the community continues to grow. We have already outgrown the meeting space, and many groups have to meet at neighboring communities. The tennis courts and pickleball courts are well used and crowded at times. With just over 2000 homes and more than 4000 more to be built, these issues will only get worse. 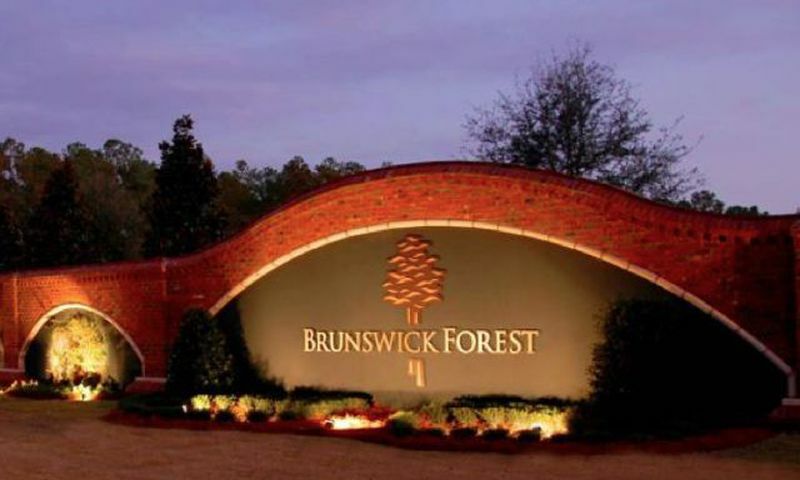 Brunswick Forest is the friendliest, most active, nicest amenities, best location community on the planet! My wife and I visited Brunswick Forest and took a tour of the facilities last weekend. We were able to see the community in all of its splendor. We were able to meet and mingle with many of the residents at the cardboard regatta and also the concert on the mall Saturday. Everyone was really friendly and willing to share their experience at Brunswick Forest with us, all of which were extremely positive. We also got to spend the day at the swimming pool and fitness center. After swimming, we visited Cape Fear National which is also located on the premises. Friday night we went into Wilmington and experienced downtown Wilmington with all of his restaurants, bars, and stores. It is really a beautiful city to be a part of. We truly fell in love with the community. This experience definitely made up our minds as to where we want to retire. A big Thanks to Chris Creekmore for helping us find our beautiful home in Brunswick Forest! He did a great job showing us the different areas of Wilmington that helped us find the perfect place for us. His knowledge and experience makes it easy to recommend him. Chris Creekmore, 55Places.com. local rep, is fabulous. On our first trip to Wilmington, Chris took the time to give us tour of the city...he took us to the local beaches, to downtown, to the local hospital helping us understand the amenities of the entire Wilmington area. Next after asking us about our housing needs, Chris took us on a tour of several communities within 20 miles of Wilmington so we could determine the top communities where we had the most interest. Three months later we returned & Chris had us look at very specific housing in each of the 3 communities where we had the most interest. Through process of elimination and after 1 more visit, we came to the conclusion that Brunswick Forest hit the most hot buttons for us. My wife and I purchased a very well-built single family home in Brunswick Fores. This is 1 of about 3 or 4 communities in the area that offer several first class builders ....you can't go wrong with any of them! This was a great experience from the initial inquiry all the way through the purchase of our property. If you are serious about the area, reach out to Chris...he's is not only very knowledgeable, but a wonderful person. The community of Brunswick Forest is just what we desired, great homes at great value, friendly neighbors, and lots of activities for residence. The Wilmington area seems to offer all the amenities needed or wanted without the North East population, and its cold weather nor the Florida heat and endless palm trees. It is hard to believe that we made a decision so quickly. We really did fall in love with Brunswick Forest the first time we visited. It was exactly what we wanted: a beautiful neighborhood, close to the beach, with an active adult community, lots of activities, and no yard work. The deal was clinched when we rode bikes (provided by the Welcome Center) around the development, talked to the residents, and found them all friendly and loving life here. When we moved in, less than four months after first visiting, we met more of our neighbors in the first week than I had met in twelve years at my townhouse in Maryland. We encountered friendly, helpful, happy neighbors. In the nearly five months we have lived here, we have continued to fall in love with the area and the development. We have participated in many of the activities offered (kayaking, line dancing, massages, personal training, pizza parties) and are loving our almost daily bike rides though the neighborhood or to the pool. Although we chose our new town, neighborhood, and home very swiftly and after only one visit, we have not regretted our decision for even a nanosecond! We are waiting for our new home to be completed. We hope we are in there by early April. Should be six months from the start date which was Aug '13, but March seems unlikely. We have been in the apt. north of Carolina Beach, since June, so we are ready to get our things out of storage and into our new home. Summer was GREAT here, we LOVE Ft. Fisher area! We have met some neighbors around the pond on Talmage Dr., and get over to BF frequently to walk our dog & exercise, use the pool, etc.. Our good friends have moved into their new home in BF on Lillibridge, and they are very happy. When we go over there, we find ourselves just looking up, as TRUSST builds a very pretty home with many details, many of which are toward & ON the ceiling. We are very excited, and are really trying to be patient. We have met our new next door neighbors and have been out with them socially many times. They will be moving into their home this week - tomorrow, actually. Their home is larger - the "Captiva" Florida style home. Too much house for us to keep clean, but they are happy. Our whole idea for this move was to simplify our lives so we have more time to "play." Brunswick Forest is surely lively. My doctor told me to start taking vitamin supplements to keep up with everyone over in BF! :0 ! Thanks for helping us realize our dream of a new, smaller, home in a fun community! We are sure we made the RIGHT decision! Thank you for introducing Candace and me to Brunswick Forest in Leland, North Carolina. We had a few concerns about our construction. The builder, JordanBuilt Homes, took care of every concern immediately. We absolutely love our neighbors and the convenience of having the community center and golf course blocks away from our new home. From picking us up at the airport to giving us Wilmington history and showing us the Mayfair Mall to helping us find the home of our dreams, our 55 Places Partner Agent was the best. They are the real estate salesman that all other agents should be judged by and set the standard that others can only hope to achieve. If I had a way to tell the thousands of other seniors who have the same apprehension about moving to Brunswick Forest, I would tell them to do it sooner rather than later. Thank you for helping us to find the glorious retirement lifestyle we dreamed about. We love the outdoors and at Brunswick Forest we can really enjoy it. The trails are fabulous, we walk nearly every single day. The pools are beautiful, we play tennis and golf too. The lake is really a special place. We love everything about the community. There are lots of activities and events to get together with neighbors and build a strong sense of community. 55places.com is not affiliated with the developer(s) or homeowners association of Brunswick Forest. The information you submit is distributed to a 55places.com Partner Agent, who is a licensed real estate agent. The information regarding Brunswick Forest has not been verified or approved by the developer or homeowners association. Please verify all information prior to purchasing. 55places.com is not responsible for any errors regarding the information displayed on this website.